Vehicle suspension plays an important part of the overall functionality of your vehicle. 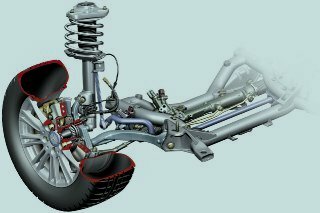 Suspension in this explanation is used to describe conventional shock absorbers such as spring and leaf suspension and its functions. How suspension functions is with a spring and a damper (a pressure tube with a piston and hydraulic fluid inside it). As the vehicle travels over rough roads the spring compresses and expands to absorb the rough ride as much as possible. The problem is that the spring continues to oscillate (bounces several times until it reaches its normal position) after a bump or hole and the damper reduces the oscillation of the spring. Common springs are the coil and the leaf. The coil spring can be around the pressure tube or at the side of it. The leaf spring has strips of metal of different lengths tied together and they can bend or flex similar to the movements of a spring. Leaf suspension is used on cargo vehicles and other heavy vehicles as buses. Reduce the effects of rolling through rough roads, uneven surfaces and vibrations from entering the passenger area to provide a smooth ride. Keeps the body of the vehicle as stable as possible to improve road handling, it cushions some of the weight which is thrown on either side when cornering. Assists in braking of the vehicle as the body that still has momentum to move is now held to the slower moving wheels by the suspension. The suspension can also determine the ride height of the vehicle. Sport versions of vehicles achieve their lower ground clearance with the use of a lower or shorter suspension. Diagram of a conventional spring suspension Suspension must be designed differently or tuned as different types of vehicles require different types of suspension for reasons we will discuss later. Considering the weight of the engine the front suspension will differ from the rear, it is able to support more weight in passenger vehicles but the rear suspension is able to support more weight in most cargo vehicles as many cargo vehicles can carry more than the weight of it's engine in their tray. Although spring suspension may not offer a ride as smooth as air or magnetic suspension but in many occasions they are tuned to give a very smooth ride, worthy of luxury status but the competitive nature will give these other suspensions the edge in the more expensive luxury vehicles. Where spring suspension shines is in sport with some factory tuning of course. While the air and magnetic suspensions can be stiffened with a sport setting, a dedicated sports car can have dedicated sport shock absorbers for a much lower price tag. True sport springs is more expensive than basic vehicle suspension but significantly cheaper than the air and magnetic. There are different springs for different functionalities. There are soft springs for luxury and hard springs for sport due to their varying capabilities and there will be vehicles with suspensions in between. Vehicles manufactured to transport cargo must also have their springs designed or tuned to cater for the load capacity so a different ride comfort and handling will be given when the vehicle is full and when it is empty.